It's come to that time again where I recolor my hair. I know, super exciting stuff. Well actually if you are someone that colors your hair unnatural shades like red and purple, this Feria Power Violet Intense Medium Violet V48 Hair Color Review will probably be interesting. 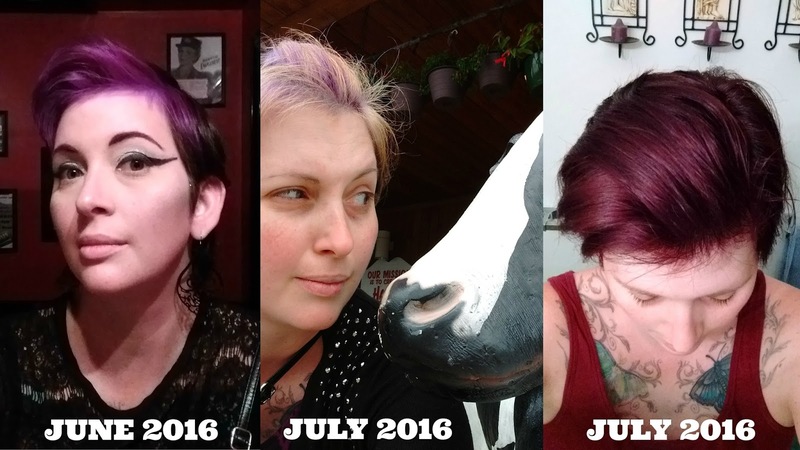 I've been coloring my hair since I was 18. It's been mostly red, but there's a few stints of blonde, pink, purple, and lots of fading into orange. It's that orange brassiness that made me switch from red to purple. The fading of purple is much nicer into a red, vs how red turns orange. Here's a few photos of my hair journey since June. I tried purple back in June for my 36th birthday, bleaching the front and using a Manic Panic color over top. It looked great at 1st. However it quickly faded, and was barely hanging on come July. I recolored it a dark red, which looked nice. 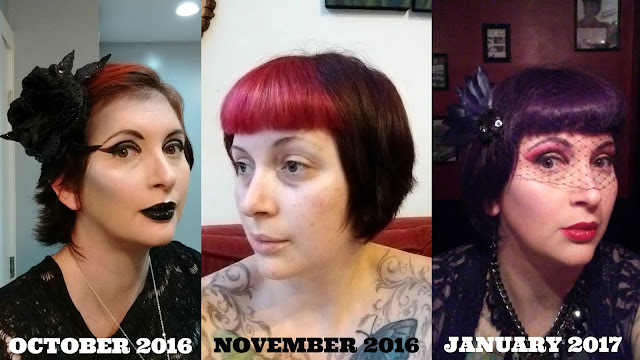 There is probably another hair coloring between July and October, because I typically redo my hair every 2 months. I might have let this go longer, since we went on a beach vacation late August. Salt water will strip color, so I didn't want to ruin fresh color. That October photo is before a Halloween event. So come November I got my hair cut into a cut bob. It's been growing out since then, and doing ok. I'm waiting until the front sides touch my shoulders, so I can get it all evened up and layered again. I redid the bleaching. I colored my bangs with a Manic Panic pink. The back is another Feria red color. The pink faded to a patchy orange. The red turned brassy. I decided to switch to purple come December. This photo is actually from a New Year's Eve masquerade, with day of fresh color. So let's fast forward to last week. I finally got back into making videos! I know right! So I made a video tutorial with lots of hair tips and exactly how I color my hair. I've only washed it once since I colored it and actually I need to wash it again today. The color fades much more subtly than the reds and Manic Panic colors. That's very nice if you're someone like me with naturally dark hair...almost black...and lots of grey mixed in. Speaking about the grey, Feria clings well to grey or um white hair. I like to call them "natural highlights". 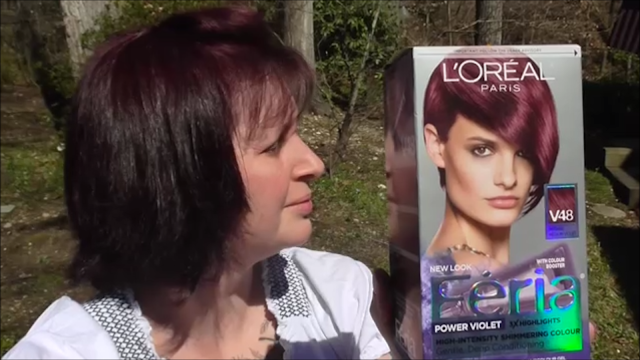 Anywho, if you're curious about this particular hair color and how I care for my hair colors, watch my Feria Power Violet Intense Medium Violet V48 Hair Color Review. If you have any questions, feel free to leave comments on the video, so I can answer them.